Fans of both Arsenal and Chelsea can actually save money by going to all 19 away league matches, rather than buying a season ticket to watch their side at home, according to a study by money-saving website Voucherbox.co.uk. 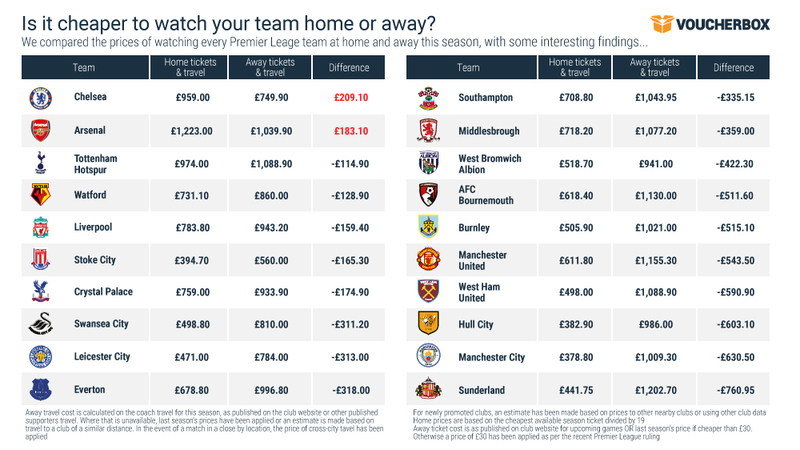 The study compares the price of a season ticket with the cost of an away ticket for each game – now capped at £30 – and also factors in the relevant travel costs for both home and away matches. Voucherbox discovered that Chelsea fans pay £209 more for home games than away fixtures whilst for Arsenal, the difference is £183. 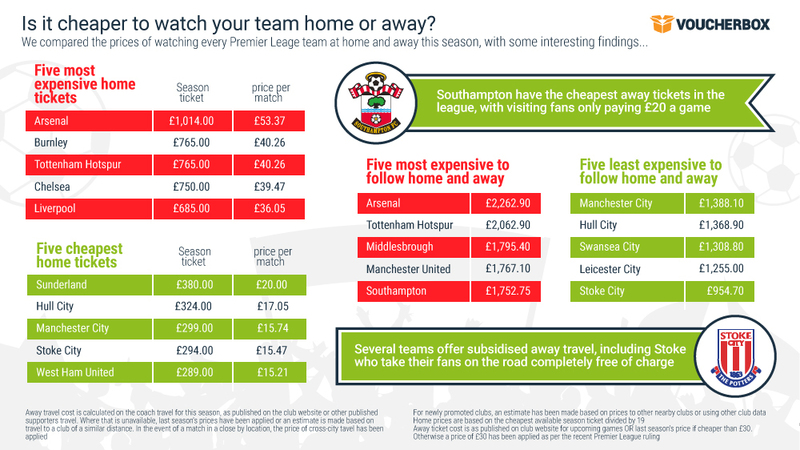 For fans of the other 18 teams, it’s more affordable to watch home fixtures than away games – although in some cases there were only small differences. For followers of Chelsea, Arsenal, Spurs, Watford and Liverpool the difference between home and away matches is under £160. Sunderland fans will feel the pinch more than any other group as following the Black Cats on the road costs fans an extra £760 a year. With the exception of West Ham, who have recently moved into their new larger-capacity London Stadium, clubs based in the capital are all amongst the seven most expensive season tickets in the league. This makes away travel a real option for Londoners seeking to watch Premier League games on a budget. At £1,014, a season ticket at the Emirates is the most expensive in the league, which means that despite the cost of away travel over the course of the season, Gooners could make a saving of £183 by going to away games only. However, heading across town to West London will provide fans with the greatest saving. Subsidised £10 coach travel provided by Chelsea leaves £209 more in Blues fan’s pockets from just attending away matches. Other clubs helping fans to travel across the country include Stoke, who fully subside the total cost of coaches for all Premier League away games, enabling fans to travel away for free. Southampton also has a handy initiative to save supporters money on their match day tickets, whereby all fans visiting St Mary’s will have any amount above £20 refunded by a Saints’ club sponsor. In addition, Swansea City has capped ticket prices at £20 for those supporting the Welsh club on the road this season. Shane Forster, Voucherbox UK Country Manager said of the findings, “The premier league agreement to cap away tickets at £30 has had a significant effect on supporters’ pockets. With many clubs now subsidising coach travel, for some fans it is now more affordable to see a match away from home. Why not make a night of it? Check out the latest and exclusive deals from Hotels.com. Home prices based on cheapest published season ticket and the price of cross-city travel in each area, in order to achieve a fair comparison. Away ticket cost is as published on club website for upcoming days OR last season’s price if cheaper than £30. Otherwise a price of £30 has been applied. Away travel cost is calculated on the coach travel for this season, as published on the club website or published unofficial supporters’ travel. Where that is unavailable, last season’s prices have been applied or an estimate is made based on travel to a club of a similar distance. In the event of a match in a close by location, the price of cost city travel has been applied. For newly promoted clubs, an estimate has been made based on prices to other nearby clubs or using other club data.